Columbus, OH – May 8, 2006. Last week a pregnant Oregon State University student with three of her friends was standing in front of The Genocide Awareness Project (GAP) in tears. One of our volunteers asked her if she was alright, one of her friends said, "She is going to kill her baby." This new mom then said, through her tears, "I can't do it. After seeing this, I can't do it." Although we are very excited when we are able to see babies saved immediately, the purpose of GAP is very much a "seed" planting type of education. Pro-abortion students may not change their mind on the spot, but walk away with something that God will use to prick their conscience. Many times the fruit of this project comes years down the road as these students who have had the true picture of abortion etched into their mind, will very often reason to a more humane response when it comes to a crisis pregnancy that they may be either directly or indirectly involved with. In the fall of 2001, I volunteered for the Genocide Awareness project when it came to the Indiana University campus. the Center for Bioethical Reform actually came to IU a year and a half earlier, but University officials attempted to restrict the display to Dunn Meadow claiming it to be the "designated free speech zone". After the University was embarrassed by the revelation that it has a history of treating the entire campus as a "free speech zone, the administration relented and allowed CBR to set up just inside the Sample Gates. Graphic abortion photos work. Pictures force people to confront the reality of abortion in a way that words cannot. It is easy to get lost in the rhetoric of abortion and think about things like "personhood", "bodily integrity", "reproductive freedom" and so forth. The photographs used by CBR through GAP, on the other hand, remind us of what is at stake. Abortion is an act that produces a dead baby. The e-mail above illustrates the direct effect these pictures have. A baby who would otherwise have been ripped limb from limb will be born because of the Genocide Awareness Project. The story is not uncommon: a four year old in my church is alive today and was adopted because of the witness of pro-life people who faithfully picket Planned Parenthood each week. Those signs have saved lives. 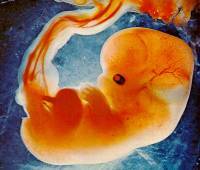 Ultrasound images worked to undermine pro-choice premises. What was called a “blob of tissue” that was easily disposed of, looked instead on the scans like a little baby. Asked to believe the pro-choice rhetoric or their own lying eyes, most people preferred the evidence of their eyes. Then, the pro-life side began to exploit its openings with a shrewd incrementalism. Gone were the calls for a constitutional amendment to ban abortion, replaced instead by a push to ban a particularly gruesome form of the procedure, partial-birth abortion. Now it was pro-choicers opposing this targeted ban who seemed like extremists. The hit that pro-choicers took was almost immediate. In September 1995, 56 percent of people described themselves as pro-choice and 33 percent as pro-life; by August 1997, this 23-point gap had sunk to just three points, 47-44. One of the ways abortion opponents used to illustrate the barbarity of partial-birth abortion was just that: illustrations. Who can forget the line drawings of a partial-birth abortion performed, step by gruesome step? Suddenly, all of the rhetoric was silenced and people saw the truth. Pro-aborts were reduced to defending the procedure as necessary for the most extreme (not to mention most rare) cases, because they could not defend PBA as an elective procedure and remain credible. See previous writings here, here, here, and here.